Rachel Dolezal: NAACP official, college professor accused of pretending to be black. 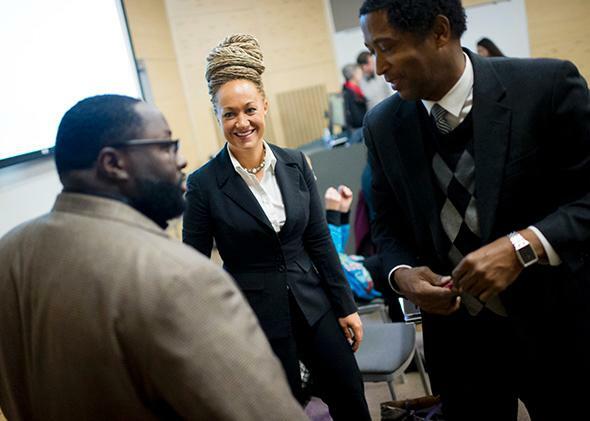 Rachel Dolezal, Spokane NAACP President, meets on Jan. 16, 2015 with Joseph M. King of King’s Consulting, left, and Dr. Scott Finnie, director and senior professor of Eastern Washington University’s Africana Education Program before the start of a Black Lives Matter Teach-In on Public Safety and Criminal Justice. NAACP Spokane Washington Branch President Rachel Dolezal is enduring a legal issue with her family, and we respect her privacy in this matter. One’s racial identity is not a qualifying criteria or disqualifying standard for NAACP leadership. The NAACP Alaska-Oregon-Washington State Conference stands behind Ms. Dolezal’s advocacy record… [W]e encourage Americans of all stripes to become members and serve as leaders in our organization. Hate language sent through mail and social media along with credible threats continue to be a serious issue for our units in the Pacific Northwest and across the nation. We take all threats seriously and encourage the FBI and the Department of Justice to fully investigate each occurrence. Rachel Dolezal is an adjunct professor of Africana Studies at Eastern Washington University. She was elected president of the Spokane NAACP last year. She serves as the chair of an ombudsman commission to represent the interests of the area’s minority groups in relations with the Spokane police. And her parents say that Dolezal has been falsely presenting herself as black for years when she is actually of “Swedish, Czech, and Geman” background with some possible traces of Native American heritage, reports the Seattle Times. [P]ublic records, including Dolezal’s own birth certificate, list her biological parents as Ruthanne and Lawrence Dolezal of Montana. The Dolezals told KXLY Thursday that Rachel is their biological daughter and that they are both white. Dolezal posted a photo (since removed) to Facebook in December of herself with a black man, identified in the caption as her father. When confronted by a KXLY reporter with the photo and asked about the ethnic background of the parents listed on her birth certificate, Dolezal abruptly ended the interview and walked away. Dolezal made news in Spokane several weeks ago when she reported receiving threatening mail, including images of nooses, in the NAACP chapter’s post office box. The materials, however, were in an envelope without postal markings, indicating it hadn’t been sent through the mail but had instead been placed by hand by the box’s owner or a postal employee. Dolezal denied placing the materials in the box. In Idaho, Dolezal took on the role as director of the Human Rights Institute, where North Idaho white supremacy groups burglarized every home she and her son lived in. Dolezal said she believes the white supremacy groups felt threatened by female power. According to Dolezal, they hung nooses in her home, vandalized and stole from her property, directed death threats toward her along with threatening to kidnap Franklin while he was in the second grade. She reported all of these acts to the police and each was admitted into police records as hate crimes, yet the culprits were never caught. Dolezal moved from home to home and everywhere she moved, they followed. The hate crimes finally ended when she moved to Spokane in 2012. According to the Coeur d’Alene Press, one of the two boys that Dolezal describes as her sons is her younger adopted brother. Dolezal, 37, avoided answering questions directly about her race and ethnicity Thursday, saying, “I feel like I owe [the NAACP] executive committee a conversation” before engaging in a broader discussion with the community about what she described as a “multi-layered” issue.